The Scot was the first person to ever feature on a commemorative bottle of Coca Cola. Legendary artist Bob Dylan revealed that ‘A Red, Red Rose’ by Burns is his source of greatest creative inspiration. It is claimed that Michael Jackson’s smash hit Thriller was inspired by the Tam O’Shanter poem. One of Burns most famous works, Auld Lang Syne, has appeared in over 170 Hollywood films including The Apartment, It’s A Wonderful Life and When Harry Met Sally. Burn’s popularity stretches much further than Scotland. At pedestrian crossings in Japan, the sound indicating that a walker can cross is a rendition of ‘Coming Through The Rye’. One of the most famous US presidents Abraham Lincoln could recite Burns’ works by heart. Burns fathered at least 13 children by four different women. His wife, Jean Armour, gave birth to nine of his children, but only three survived infancy. Burns’ oldest child, Elizabeth was born after he had an affair with his mother’s servant and his youngest son Maxwell, was born on the day of his funeral. John Steinbeck took the title of his 1937 novel ‘Of Mice and Men’ from a line a Burns poem ‘To a Mouse’ which reads, ‘the best laid schemes o’ men an’ men/ gang aft agley’. American designer Tommy Hilfiger claims to be a great, great, great nephew of Robert Burns. Astronaut Nick Patrick carried a miniature book of Burns poetry on a two week long space mission with him in 2010. It completed a 5.7 million mile trip and 217 orbits of the earth. There are more statues, monuments and memorials dedicated to Robert Burns than any other non-religious figure, after Queen Victoria and Christopher Columbus including one in New York’s Central Park. Say ‘Slangevar’ with friends, family or book in for a unique date night! We are ending (dry) January by toasting Scotland’s bard with a delicious three-course dinner in our beautiful Restoration Café. Most importantly, for this special evening opening, chef Colin Halliday has created a menu comprising such culinary delights as haggis, neeps and tatties with whisky cream (of course), Scottish salmon with Crowdie cream cheese, pickled cucumber and radish salad and Scotch Lamb with root vegetables and fondant potatoes. Team your choice with some delicious whisky from our drinks menu and it will be a celebration worthy of our nation’s favourite poet. We’re taking bookings from 6pm to 8.30pm. 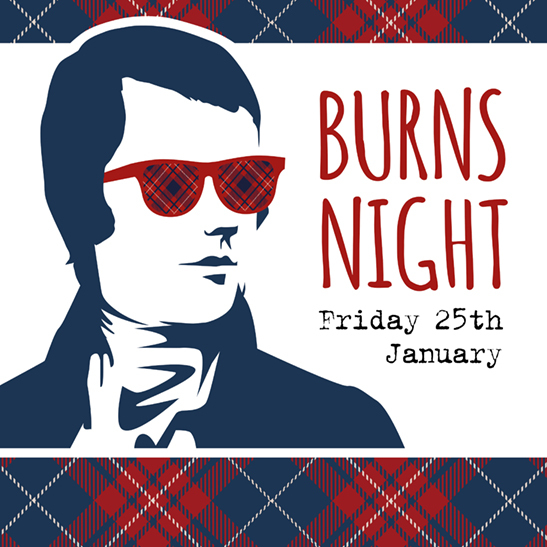 For more information or to book, give us a call on 0131 322 2572 or book online using the OpenTable app below for 25th January.